It is my pleasure to participate in the first-ever Blog Hop co-hosted by Carter's Crafting Corner and C'est La-Vie Designs Unlimited, LLC. ... combining it with the "True Thank You" sentiment that's a special CTMH stamp where the profits from sales of this stamp benefits the American Red Cross for relief/aid to those affected by the recent Oklahoma tornadoes. Several people have asked me how I made the stars paper as well as the banner. For the stars paper, simply repeat the small star stamp over and over as many times as you like. I used CTMH's Exclusive Ink in "Outdoor Denim", stamped on CTMH's Colonial White paper. For the banner, I used the straight edge of the striped flag stamp and repeated it over and over in a straight line on a strip of paper that was 1.25" high x 12" wide. Then, masking the stripe, I stamped with the straight edge of the star stamp. I cut the banners from the strip of paper, with the top of the banner measuring 1" wide. Sales of the "Home of the Brave" stamp set benefit the USO and our soldiers everywhere. I think these stamps are beautiful to use year-round, especially on cards for our soldiers that you may make through Operation Write Home. Please consider volunteering your time and talent for this wonderful cause! Love your card, great stamp set too; tfs! Love it!!! You did great with that stamp set! Great techniques Ellen - so happy to be hopping with you! Loving the stamp set. Very nice. Beautiful card! Very talented thanks for sharing! Plus I am a new follower of your blog! I like that trifold effect. Nice. Thanks for participating in our first hop! You did a great job! I'm headed over to check out the "tute"! This is one of my favorite folds, I found it on SCS as well. Your card is beautiful. Fabulous--love the fold and the stamps you used. That is so cute! Never made one before so heading on to the tute :) Thanks for sharing! I love your card! I love shutter cards and you made an amazing one! 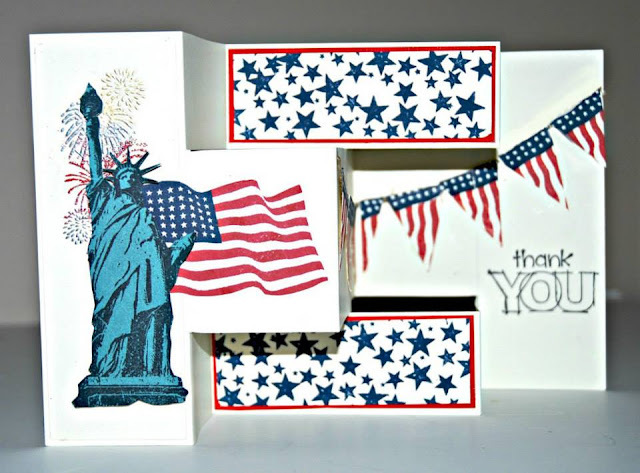 Ellen, Love the tri-fold card you crafted and chose to share on this new hop, Thank you! What a fantastic Thank you stamp too! I love it. Such a great card! What a way to share your love for this country! Love the card and LOVE the STAMPS!!! What a wonderful card! I just love that gorgeous statue of liberty image! Nice card!! I love making these!! I have followed you for 3 years now!! TFS!! Fabulous card! Love your use of the stamps! Um, wow! Check you out totally working that flag stamp to make an awesome banner! I want to fo that but I'm afraid mine would NEVER look that good... Thanks for the linkup on the card tutorial! Thanks for the extra blog candy giveaway opportunity! I'm a follower! Love this card. Great job! Awesome card!! I have used that tutorial to make other cards and this one is too cute. Love also that you are supporting Operation Write Home.... I have sent cards to them as well!! Also thanks for the opportunity to win the stamp set !!! I've been seeing that one and think it would be great to use!! Love the fold! Very creative! I Love this card great job!!! !